Fortress Of Freedom Board :: View topic - Best HD Camcorder For Indie Filmaking! Best HD Camcorder For Indie Filmaking! Posted: Sun Sep 09, 2007 7:49 pm Post subject: Best HD Camcorder For Indie Filmaking! With the decisions like that of the Toronto International Film Festival to only accept High-Definition video as minium standard in 2008; small production houses like Fortress were forced to accept this new standard and prepared for it. With that in mind, I had to pick a camcorder that could give us the highest quality image at the lowest cost, not an easy task. 2. AG-HVX200 - The Panasonic was the evolution of the indie filmaker's favorite camcorder - the DVX100. The HVX200 records on DVCPRO which is not as compressed as HDV found on Sony and Canon camcorders. Because of this, the camcorder cannot fit all the data on mini-DV tape (that is still used in the HVX200 for Standard Definition and Sony and Canon HDV camcorders), so you must either capture to a portable hard-drive or Panasonic P2 cards (each at 800 to 2,000 dollars for 18 - 32 minutes per card). This camcorder has the best lens and the most format choices (we will spare you the details) and control of any other contender. Since the camcorder averages and extra 1,500 for the camcorder alone and you must add P2 cards along with everything else, the camcorder becomes the most expensive in our group and almost double the cost to operate than the cheapest. Because of this cost and the unavailability of P2 cards and work flow hassles; the Panasonic was discarded, but ultimately would have been our second choice. 4. Canon XHA1 - This was the camcorder I got after returning the Sony. This is the one you slowly read between the lines and see as the giant killer of camcorders. This is the one you see people who work in the industry using. I was hesitant to buy the Canon as quality control was always an issue unlike the Sony. However the image is king and the Canon gives the best image short of a 60,000 dollar camera at the present time! The plastic is questionable and such - but that image. I showed some video on the HD TV and came to within inches of the screen and it looked like the camera's resolution was better than the TV's ability to display! The camcorder had it's problems. 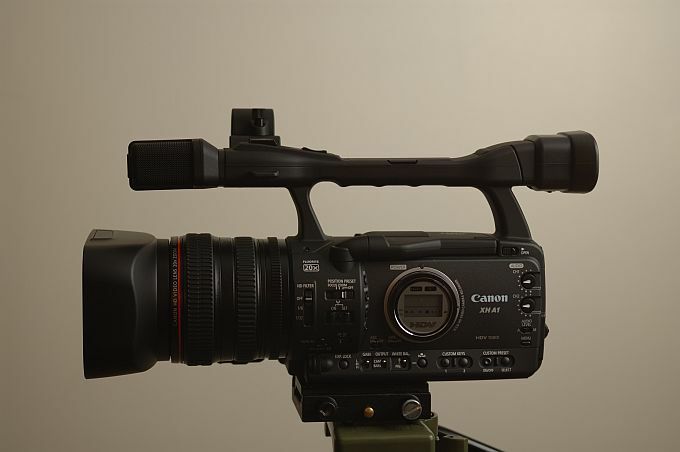 First was that the camera only had onboard microphones unlike the shotgun that was found on the Sony and JVC; but is did have XLR inputs and a shotgun microphone holder. 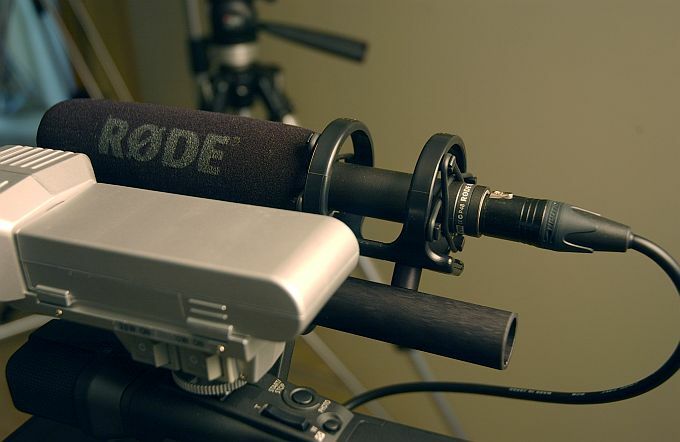 I spent extra dollars on a Rode NTG-1 microphone and had one week of grief. The camera has some horrible internal harmonics when used and no matter much isolation material I used to mount the shotgun microphone, a very noticeable hum would be heard. I resolved this by buying a suspension for the microphone that fitted in the camera's shotgun holder as can be seen below. The other gripe was the bad zoom ring, but for newbies like us, the servo zoom is one of the best with 16 speeds and variable! The Canon seems to be the best in low light , but I included a low slung permanent light on the cold shoe. I don't need it all that often but it is there all the same and puts out 10/20/30 watts, a dispersion dome seems an easy fit to this unit (we shall see). The camera also has the most adjustments second to the HVX200 and as such it is rapidly becoming the favorite selection of indie film makers. So the Canon was it, and so ends my two weeks of hell making sure our purchase was the right on. Buying camcorders is an exercise in obsolescence as the technology keeps changing. However, after the Sony CMOS fiasco; I will stay clear of these sensors until they get the technology right. Anyway, that was my experience buying at this moment in time. 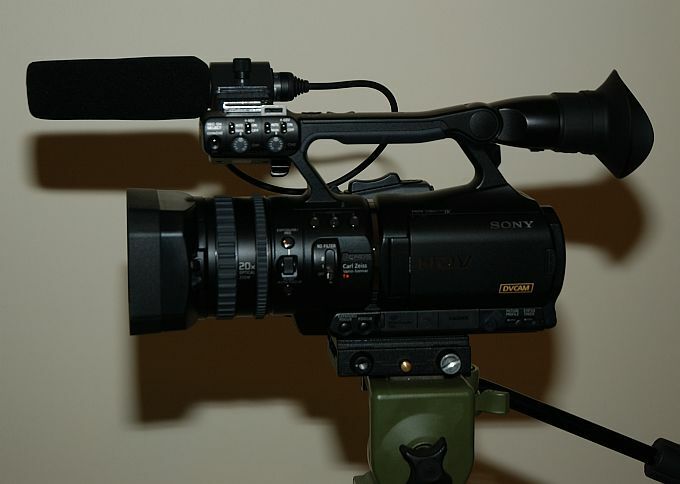 I now go back to my usual duties and the camcorder goes into the equipment pool for use in our productions.